Secret Garden Slot is a Rival Gaming 20 payline, 5 reel slot with a wild symbol, scatter symbols and a bonus game feature. You can win up to 50 free games in the bonus feature. Enter the secret garden to collect loads of cash! 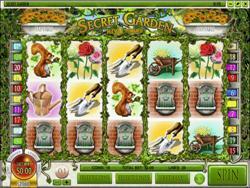 Secret Garden Slot is a 20 payline, 5 reel slot with a wild symbol, scatter symbols and a bonus game feature. 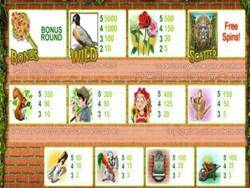 If 3 or more Garden symbols appear scattered on the screen - 20, 30, or 50 free spins with a 2x multiplier. The Master Key is a scatter which will activate the Secret Garden bonus round. If 3 of these keys during the same spin you will get to enter the Secret Garden Bonus Round.